Images depicting cordectomy can be seen below. Diagram showing the incision line (blue dotted line) for right posterior cordectomy in cases of bilateral abductor paralysis. Diagram showing the result of right posterior cordectomy in cases of bilateral abductor paralysis. The vocal folds, also known as vocal cords, are located within the larynx (also colloquially known as the voice box) at the top of the trachea. They are open during inhalation and come together to close during swallowing and phonation. When closed, the vocal folds may vibrate and modulate the expelled airflow from the lungs to produce speech and singing. For more information about the relevant anatomy, see Vocal Cord and Voice Box Anatomy. When the vocal cords' mobility is impaired. When the thyroid cartilage is invaded by the tumor. Type I: Subepithelial cordectomy, which is the resection of vocal cord epithelium passing through the superficial layer of lamina propria . Type II: Subligamental cordectomy, which is resection of epithelium, or Reinke’s space and vocal ligament. Type III: Transmuscular cordectomy, which proceeds through vocalis muscle. Type IV: Total cordectomy, which extends from vocal process to the anterior commissure. 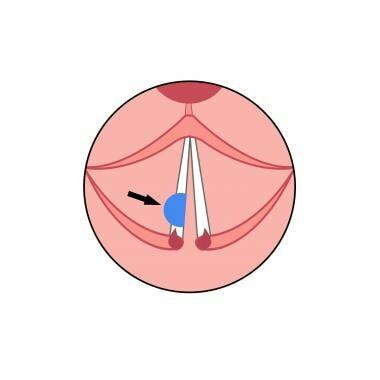 Type Va: Extended cordectomy encompassing the contralateral vocal fold. Type Vb: Extended cordectomy encompassing the arytenoids. Type Vc: Extended cordectomy encompassing the ventricular fold. Type Vd: Extended cordectomy encompassing the subglottis. This classification did not propose any specific management for the lesions arising from the anterior commissure, which are being included among the indications for type Va cordectomy. To solve this problem, new cordectomy, encompassing the anterior commissure and anterior part of vocal cord, was proposed by European laryngology society working committee on nomenclature. This is classified as type VI. European Laryngological Society classification allows one to define and clearly distinguish the extent of excision, which facilitates making meaningful comparisons between vocal outcomes after different types of cordectomy. Atropine is always included in premedication. Anesthesia is induced by intravenous injection of barbiturates or by application of gas mixture via a mask. Relaxation is usually achieved by a bolus of succinyl choline. A long term relaxant is preferred for cordectomy. The anesthetic usually consists of gas mixture such as halothane, nitrous oxide and oxygen. For more information, see general anesthesia. Various laryngoscopes, including bivalve adjustable laryngoscopes are used to expose the larynx. Two suction devices: one is mounted on to the operating microscope and the other suction is used by the surgeon to evacuate the plume and to manipulate the tissue. This involves the resection of vocal fold epithelium, passing through the superficial layer of the lamina propria. It is performed for premalignant lesions and lesions that show malignant transformation. Usually entire vocal cord epithelium is resected and in rare cases, clinically normal epithelium may be preserved. Since subepithelial cordectomy ensures histopathological examination of entire vocal cord, the main role of this surgical procedure is diagnostic. This procedure can also be therapeutic if histological results confirm hyperplasia, dysplasia, or carcinoma in situ without signs of microinvasion. This is indicated for cases of microinvasive carcinoma or severe carcinoma in situ with possible microinvasion. In this procedure vocal cord epithelium, Reinke space, vocal ligament are resected by cutting between the vocal ligament and vocalis muscle. The resection may extend from the vocal process to the anterior commissure and vocalis muscle is preserved as much as possible. This procedure is indicated for small superficial lesions of the mobile vocal folds that reaches the vocalis muscle and without deeply infiltrating it. This involves the resection of epithelium, lamina propria and the part of vocalis muscle. The resection may extend from the vocal process to the anterior commissure. In some cases, partial resection of the ventricular fold may be required for adequate visualization of the vocal fold (see video below). Type III TMR vocal cordectomy for T1 glottic squamous cell carcinoma. Video courtesy of Nader Sadeghi, MD, FRCSC. This procedure is indicated for T1a lesions infiltrating the vocalis muscle. The resection extends from the vocal process to the anterior commissure and attachment of vocal ligament to the thyroid cartilage should be cut. The depth of the surgical margins reaches the internal perichondrium of the thyroid cartilage and sometimes perichondrium is included with resection. This surgical approach was meant to include the anterior commissure and, depending on the extent of tumor, either a segment or the entire contralateral vocal fold. This procedure is now replaced by type VI cordectomy. This procedure is indicated for vocal fold carcinoma involving vocal process or arytenoid cartilage posteriorly. For this type of resection, arytenoid cartilage should be mobile, and the cartilage is partially or fully resected. This procedure is indicated for ventricular cancers or trans glottis cancers that spread from vocal fold to the ventricle. This involves the resection of ventricular fold and Morgani’s ventricle. This procedure can be used for selected cases of T2 carcinoma with limited subglottic extension without cartilage invasion. This procedure is indicated for cancer originating in the anterior commissure involving one or both the vocal cords, without infiltrating the thyroid cartilage. The surgery comprises anterior commissurectomy with bilateral anterior cordectomy. If the tumor is in contact with cartilage, resection can encompass anterior part of thyroid cartilage. Resection of the anterior commissure may include the subglottis mucosa and cricothyroid membrane, because cancers of anterior commissure tend to spread toward the lymphatic vessels of the subglottis. The pharynx and teeth should be checked for damage before extubating from anesthesia. General complications include circulatory and respiratory disorders resulting from anesthesia. Local injuries such as injury to the teeth, tearing and laceration of palate. Laceration, hematoma of lips or tongue can usually be prevented by careful introduction of laryngoscope. These injuries are caused by pressure of the laryngoscope on the base of tongue or oropharynx. Deeper laceration should be sutured immediately and antibiotics should be given to prevent parapharyngeal extension of infection. Bleeding from larynx during or after operation may be present after cordectomy. Hemostasis can usually be achieved by adrenaline-soaked pledgets or deliberate coagulation. Massive bleeding may demand ligation of superior laryngeal artery. Postoperative edema is uncommon and prophylactic steroids can be used to prevent edema. Granuloma scars and adhesions can develop after surgery. Endoscopy under general anesthesia should be carried out at least every 2 months for first two years after surgery and with decreasing frequency in the subsequent years. Spiegel JR, Sataloff RT. Surgery for carcinoma of the larynx. Gould WJ, Sataloff RT, Spiegel JR. Voice Surgery. St. Louis: Mosby; 1993. 307-337. De Diego JI, Prim MP, Verdaguer JM, Pérez-Fernández E, Gavilán J. Long-term results of open cordectomy for the treatment of T1a glottic laryngeal carcinoma. Auris Nasus Larynx. 2009 Feb. 36(1):53-6. [Medline]. Chung SY, Kim KH, Keum KC, Koh YW, Kim SH, Choi EC, et al. Radiotherapy Versus Cordectomy in the Management of Early Glottic Cancer. Cancer Res Treat. 2018 Jan. 50 (1):156-163. [Medline]. [Full Text]. Citelli C. Chordectomia externa und Regeneration der Stimmlippen. Ueber eine neue Behandlungsmethode aller Kehlkopfverengungen infolge dauernder Medianstellung beider Stimmlippen. Arch Laryngol Rhinol. 1908. 20:73-97. Sapundzhiev N, Lichtenberger G, Eckel HE, et al. Surgery of adult bilateral vocal fold paralysis in adduction: history and trends. Eur Arch Otorhinolaryngol. 2008 Dec. 265(12):1501-14. [Medline]. Jackson C. Ventriculocordectomy: a new operation for the cure of goitrous paralytic laryngeal stenosis. Arch Surg. 1922. 4:257–274. Hoover WB. Bilateral abductor paralysis: operative treatmentby submucous resection of the vocal cord. Arch Otolaryngol. 1932. 15:337–55. Surján L. [Submucous chordectomy as a glottis-enlarging operation]. HNO. 1965 Aug. 13(8):231-3. [Medline]. Benninger MS, Bhattacharya N, Fried MP. Surgical management of bilateral vocal fold paralysis. Operative Techniques in Otolaryngology-Head and Neck Surgery. 1998. 9:224-9. Kleinsasser O. Microlaryngoscopy and endolaryngeal microsurgery. New Delhi: JP Medical Ltd; 1995. 17-30. Remacle M, Van Haverbeke C, Eckel H, et al. Proposal for revision of the European Laryngological Society classification of endoscopic cordectomies. Eur Arch Otorhinolaryngol. 2007 May. 264(5):499-504. [Medline]. Remacle M, Eckel HE, Antonelli A, et al. Endoscopic cordectomy. A proposal for a classification by the Working Committee, European Laryngological Society. Eur Arch Otorhinolaryngol. 2000. 257(4):227-31. [Medline]. Eckel HE, Perretti G, Remacle M, Werner J. Endoscopic Approach. Remacle M, Eckel HE. Surgery of larynx and trachea. Berlin, Germany: Springer-Verlag; 2010. 107-214. Hogikyan ND, Batisan RW. Surgical therapy of glottic and subglottic tumors. Thawley SE, Panje WR, Batsakis JG, Lindberg RD. Comprehensive management of head and neck tumors. 2nd ed. WB Saunders Company; 1039-68. Georgescu C, Margaritescu C, Osman I, Stoica M, Mitroi M, Surlin V. Therapeutic management of massive subcutaneous emphysema, bilateral pneumothorax and pneumomediastinum after anterior cordectomy for in situ vocal cord carcinoma - case report. Chirurgia (Bucur). 2014 Nov-Dec. 109(6):822-6. [Medline]. Oswal VH, Gandhi SS. Endoscopic laser management of bilateral abductor palsy. Indian J Otolaryngol Head Neck Surg. 2009. 61:47–51. Khalifa MC. Simultaneous bilateral posterior cordectomy in bilateral vocal fold paralysis. Otolaryngol Head Neck Surg. 2005 Feb. 132(2):249-50. [Medline]. Mendelsohn AH, Xuan Y, Zhang Z. Voice outcomes following laser cordectomy for early glottic cancer: a physical model investigation. Laryngoscope. 2014 Aug. 124(8):1882-6. [Medline]. [Full Text]. Kennedy JT, Paddle PM, Cook BJ, Chapman P, Iseli TA. Voice outcomes following transoral laser microsurgery for early glottic squamous cell carcinoma. J Laryngol Otol. 2007 Dec. 121 (12):1184-8. [Medline]. [Full Text]. Lee HS, Kim JS, Kim SW, Noh WJ, Kim YJ, Oh D, et al. Voice outcome according to surgical extent of transoral laser microsurgery for T1 glottic carcinoma. Laryngoscope. 2016 Sep. 126 (9):2051-6. [Medline]. Dedo HH. Surgery of the larynx and trachea. Philadelphia: BC Decker Inc; 1990. 207-208. Medscape Reference thanks Nader Sadeghi, MD, FRCSC, Professor, Otolaryngology-Head and Neck Surgery, Director of Head and Neck Surgery, George Washington University School of Medicine and Health Sciences, for assistance with the video contribution to this article.